As I’ve been in New York thinking about how this project would work I’d come up with many theories on the cording aspect of it — none of which I knew would work. Everyone I spoke with agreed the cord process would be the hardest to decide upon. I did learn, the messy way, that I was unable to felt cord of any scale in my apartment but I did make a three foot long model, only partially destroying my bathroom in the process. In New Hampshire I have much more room and just about every tool or material I might need for felting. There it is. 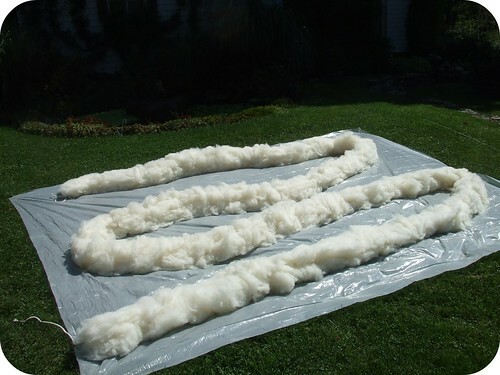 Above is 40 feet of cording made of five pounds of wool, pre-felting. I laid it out on the tarp inside and then dragged it out through the side door — things I didn’t take into account included, the wind, the grade of the lawn, the width of the door — I’m learning! Isn’t it beautiful? 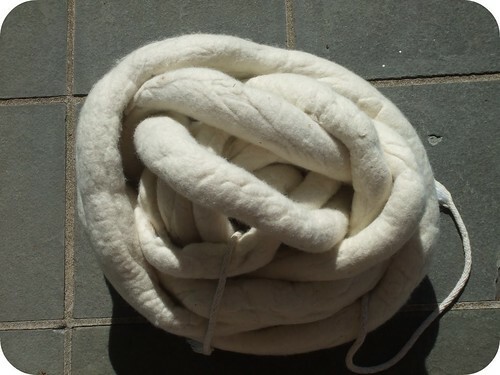 I laid out the fibers crossing each other for maximum felting and, in what might be considered cheating, I laid a cotton rope in the middle of the fleece when I was halfway through so that even if it didn’t felt consistently it would have the rope in the midst of it to hold onto – a great idea from the mill owner! And so we felted, Courtney and I, with the old pool cover cut up into strips of industrial bubble wrap. I bought gloves that had grit in their coating to hold the plastic better, rigged the outdoor shower to pump hotwater to us (only mild injuries were recieved by my mom when a huge hornets nest was discovered in the shower) and we just went for it. We laid it out on the deck to dry, it didn’t, it started to smell so we made the gametime decision to stick it in the washing machine. We threaded the cord into 16 pairs of nylons, which we cut the feet off of and set the machine to “normal soil.” When we took it out, it was perfect. This entry was posted on Saturday, September 12th, 2009 at 6:12 pm and is filed under Felting, Process and Yurt. You can feed this entry. You can leave a response, or trackback from your own site.